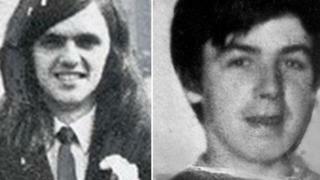 Two brothers killed in the Birmingham pub bombings were celebrating news of a pregnancy, inquests have heard. Two bombs ripped through the Mulberry Bush and Tavern in the Town pubs, killing 21 and injuring 220 on 21 November 1974. Inquests into the deaths heard siblings Eugene and Desmond Reilly went out "in great spirits" on the night they died. The hearing was also told how officers were policing an IRA member's funeral at the time of the attack. Jurors heard further "pen portrait" tributes to victims of the blast, with Sean Reilly reading the tribute to his younger brothers. Recalling his final memories of Eugene and Desmond, who were in the Tavern in the Town, Mr Reilly said the "bombers took away our brothers' futures". "Eugene never had the opportunity to get married and have children and Desmond never got the opportunity to meet his son," he said. "Part of us died with them on the day they died." He said Desmond was "delighted that his wife Elaine was pregnant" and was seen looking for Eugene to celebrate with him on the afternoon of the attack. Their sister Mary was invited to join them for a drink, "but she had just finished work and said that her mother was expecting them home for dinner". Jane Davis, 17. Her brother Brian said she had aspirations of becoming a nuclear physicist. He added: "When she died, it was like a light went out." Anne Hayes, from Sutton Coldfield, 19, a shop assistant at Miss Selfridge in Lewis's department store. She died at the Tavern in the Town. Thomas Chaytor, a divorcee with two young children. Girlfriend Susan Hands said they had met while working at Rackham's department store. She said he had taken on a part-time job at the Tavern in the Town just weeks before the bombings, she said. Former counter-terror chief Anthony Mole told the hearings at Birmingham Civil Justice Centre the bombings happened at the same time as the funeral procession for IRA member James McDade. There was a large-scale police operation as his remains were moved from Coventry mortuary to Elmdon airport, Mr Mole said. He had been killed planting a bomb on the Coventry GPO telephone exchange the week before. Mr Mole read from a report of a Supt Jones, who said the bombings happened while the city centre was "denuded of uniformed police officers". However, the officer said it was felt it "in no way affected the organisation and efficiency of the police at the scenes". He said after the airport received word of an emergency in the city centre, a division contingent and special patrol group were immediately sent - providing more officers at short notice than would normally have been available. An expert witness, Prof Thomas William Hennessy, also gave historical context on Anglo-Irish history and the formation of the IRA. He said there was a divide in Northern Ireland between largely Protestant unionists who wanted to maintain a link with Britain and the primarily Catholic nationalists, who want a united Ireland, following the division of the country on 3 May 1921 under the Government of Ireland Act 1920. "Temperatures between the two communities rise, resulting in violence 1969," he said. The Irish Republican Army, a paramilitary group who wanted a united Ireland, then split into the Official IRA and Provisional IRA, and the latter began a bombing campaign against Britain in 1973. On Thursday, jurors will be taken to the former sites of the pubs. Amendment 14 March 2019: This story has been updated to reflect the most recent information that 220 people were injured in the blasts.